The guides make or break a trip like this. 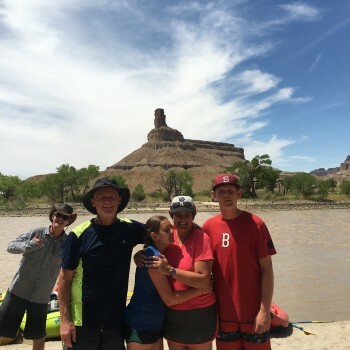 Our guides on the Desolation Canyon rafting trip were wonderful and made all the difference. They were up before us making breakfast and the last to go to bed after dinner. After a huge day of rowing and managing big heavy rafts. Even though the guides worked hard to keep us safe throughout most of the day, some guides played in the water with the kids while the other guides got to know the parents and other people on the trip. Also, on the raft the guides were talkative, friendly, and kept everyone including themselves on the raft entertained and happy. It was amazing how excellent the meals were, considering we were literally in the wilderness for 5 days. Equipment was perfect - comfy, collapsible cots, easy-to-assemble tents and good sleeping bags (all nicely dry in a personal dry bag). Rubber duckie kayaks were super fun, especially in the white water. 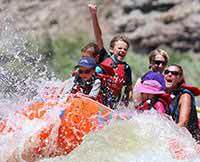 I highly recommend the Desolation Canyon rafting trip, especially for families with kids. Not a super exhilarating white water experience, but nevertheless, really fun and relaxing!